Willie Nelson & Family - Otter Productions Inc. | Otter Productions Inc. Willie Nelson & Family - Otter Productions Inc.
Wille Nelson returns to the Central Coast on Friday, October 21st, this time to the beach at California’s Premier Beachfront Concert Venue, the Avila Beach Resort! 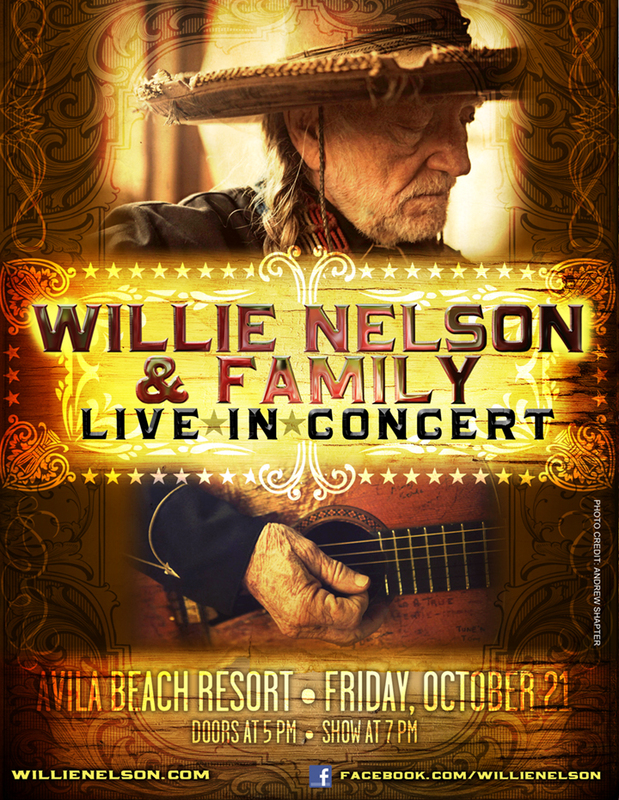 Bring your boots to the Beach and get ready to party with Willie Nelson & Friends on Friday night, October 21st! With Reserved and General Admission Lawn tickets available for sale, this will be an evening concert, gates open at 5PM and the show will start at 7PM and continue into the evening. In the style of any great outdoor venue, you will be able to enjoy your favorite libation (adult beverages and premium beer and wine will be available for sale), snack (upgraded concert snacks available for purchase), watch world-class entertainment under the afternoon sky with your backdrop the Pacific Ocean. 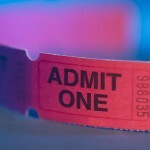 Advance Reserved and General Admission tickets are on sale now at all VALLITIX outlets including Boo Boo Records in San Luis Obispo; on-line at www.vallitix.com or purchase by phone at 1 888 825-5484. On the Cal Poly Campus at the PAC Box Office, on line at: https://tickets.calpoly.edu/Online/otter . All Ages. 7 and under admitted free in Lawn Seating only when accompanied by paid adult, one child per one paid adult. Rain or Shine. Please no outside food or beverages. No pets. No umbrellas. Low-backed lawn chairs (2’ maximum back height) and blankets allowed in Lawn Seating. A portion of the proceeds to benefit the Rossi Foundation and the local charities it serves. With a six-decade career and 200 plus albums, this iconic Texan is the creative genius behind the historic recordings of Crazy, Red Headed Stranger, and Stardust. Willie Nelson has earned every conceivable award as a musician and amassed reputable credentials as an author, actor and activist. He continues to thrive as a relevant and progressive musical and cultural force. In the last five years alone he delivered nine new album releases (of which one resulted in a Grammy Award win), released a Top 10 New York Times’ bestsellers book, again headlined Farm Aid, an event he co-founded in 1985, received his 5th degree black belt in Gong Kwon Yu Sul, and graced the cover of Rolling Stone magazine. In 2013, Willie’s albums included Let’s Face The Music And Dance, an album of deep pop country repertoire classics performed with transformative patented ease by Nelson and Family, his long-time touring and recording ensemble; and To All The Girls… which features 18 duets with music’s top female singers. In 2014, he released Band of Brothers, a 14-track studio album of new recording that debuted at #5 on Billboard’s Top 200 album chart and #1 on Billboard’s Country album chart, and December Day: Willie’s Stash Vol. 1, an eclectic album collaboration of intimate new recordings from Willie and Sister Bobbie Nelson. This year he adds two more titles. On May 5, 2015, “It’s A Long Story: My Life,” the unvarnished and complete story of Willie, hit bookshelves and landed him on the New York Times’ bestsellers list. In June, a new album with Merle Haggard titled Django And Jimmie, debuted at #1 on Billboard‘s Country album chart and #7 on Billboard‘s Top 200 album chart. Doors are at 5PM. Show starts at 7PM. The approximate show times are: Special Guest 7PM. Willie Nelson & Family – 8PM till closing. There will be a Golden Circle Reserved Area with chairs closest to the stage. There will also be General Admission Lawn Seating. Okay to bring blankets and low-backed chairs (less than 2’ high) into General Admission Lawn area. Advance and Reserved tickets on sale now at all VALLITIX outlets including Boo Boo Records in SLO... (888) 825-5484, vallitix.com; on the Cal Poly Campus at the PAC Box Office, on line at: https://tickets.calpoly.edu/Online/otter . All Ages, Rain or Shine.